PULLMAN, WASH. — The first wet and stormy evening of fall didn’t dampen the spirits of those who watched the Emmy Award-winning documentary “Witness: The Legacy of Heart Mountain” at Washington State University on Oct. 15. 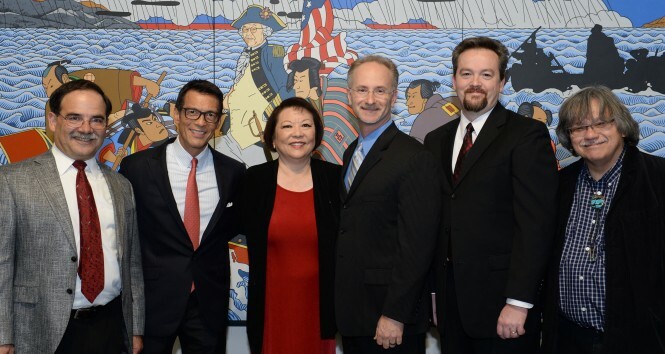 Following the special screening of the film, co-producers David Ono, a news anchor for ABC7 Los Angeles Eyewitness News, and award-winning editor and videographer Jeff MacIntyre, who also owns Content Media Group, received the question that they hoped they would hear. The question provided Ono and MacIntyre the perfect opportunity to urge everyone in the audience to keep the story alive by sharing it with family members, college roommates, teachers and anyone who will listen. The October 15 screening of “Witness” was part of an unprecedented series of campus events designed to educate citizens about the internment of Japanese and Japanese Americans during World War II. The event coincided a special Roger Shimomura exhibition in the WSU Museum of Art (closing Dec. 31), an exhibit put together by WSU’s Student Entertainment Board in the Compton Union Building Gallery displaying internment artifacts donated by WSU alumni (closing Nov 14), and a photo collection display of WSU’s George and Frank C. Hirahara Collection in the Terrell Library MASC. The father and son team snapped more than 2,000 photos of life in the Heart Mountain Relocation Camp in Wyoming while they were interned there during the war. It was the WSU Hirahara Family Collection that inspired Ono and MacIntyre to create the “Witness” documentary. WSU junior Gregory Lew’s grandparents were sent to the Gila River Relocation Center in Arizona. Based upon the limited information they shared about their camp experience to Lew, he knew his grandparents had to be strong to survive. Prof. John Streamas said that many high school and college textbooks don’t include the topic of Japanese internment, and people are often shocked to learn something like this occurred in American history. College of Communications staff member Jeff Snell grew up in Powell, Wyo., about 20 miles away from Heart Mountain. His family frequently drove by the Relocation Center, but said the U.S. government kept so quiet about what was happening there, the locals didn’t even know. Anna Maria Shannon, associate director of the WSU Museum of Art, said the film definitely got people talking on the WSU campus and in the Pullman community. By donating her grandfather and father’s photos to her father’s alma mater, Patti Hirahara wanted them preserved for future generations to see and learn from. Numerous WSU colleges and departments organized lectures and hosted Japanese American alumni this fall. They include Architectural, Human and Natural Resource Sciences; History; Engineering; School of the Environment, Critical Culture, Gender and Race Studies; Murrow College of Communication; and Athletics. The day after the film screening, KWSU-TV and KTNW-TV aired the documentary on Northwest Public Television and plan to show it again in the new future. To view a complete list of Japanese internment events and activities at WSU, visit http://museum.wsu.edu/events.html. I was surprised when I read in my grandson’s Washington State approved high school history book that the Internment was apparently the idea of some Army general. It completely whitewashed the fact that it was President Roosevelt who issued the order through Executive Order 9066 to imprison over 100,000 innocent men, women and children for three years, without a single hearing to prove that any of them had ever committed a treasonous act. Roosevelt acted against the advice of his attorney general and the FBI, who thought the only people who might be justifiably detained were older Japanese immigrants, who could then be interrogated, assessed, and released if no evidence was found. Instead, Roosevelt with the stroke of his pen took away the liberty and property of a city full of American citizens, with no due process of law, no right to counsel, no just compensation for the loss of their homes and farms and businesses. And not a single one of them was ever shown to be disployal to the US. Indeed, many thousands of them volunteered for military service, joining the 442nd Regimental Combat team which was bloodied in Italy and France, becoming one of the most decorated units of its size in the war. Many Japanese Americans were also enlisted in the less known intelligence service in the Pacific, where they translated intercepted Japanese communications and interrogated Japanese POWs. One of my mentors as a young man was Russell Horiuchi, a professor of geography, who had served in Intelligence and then at General MacArthur’s headquarters in Tokyo. Roosevelt is such a culture hero for many people, manifested in the recent Ken Burns documentary, that I can understand it is hard for them to accept how harsh and unjust the man was in this spectacular instance. He had displayed his prejudice against Japanese people quite publicly in 1923 when he wrote articles in national magazines supporting the passage of the bill that excluded all further immigration from Japan. That law was still in effect when I was born in Japan in 1949 as the son of a Japanese mother married to an American Air Force sergeant. A special bill was introduced by Senator Elbert Thomas of Utah to allow my mother and me to immigrate, which was happily overcome by events when a general statute was passed and signed by President Truman that gave resident alien status to Japanese war brides and citizenship to the children of US servicemen born abroad. Another villain of the internment episode was Earl Warren, then Attorney General of California and Republican candidate for governor, who stoked the flames of prejudice against Japanese Americans in order to get elected. One wonders how much of his efforts to promote civil rights as Chief Justice of the Supreme Court were driven by his guilt over his awful role in the abrogation of the civil rights and liberties of tens of thousands of the citizens whom he was sworn to protect as a state officer. Students need to know that the Department of Justice and the Army lied to the US Supreme Court when a few of the internees asked the courts to release them. Based on their lies about the “military necessity” of the Internment, the majority of the court allowed it to proceed, a necessary lesson that the Supreme Court is not a body of enlightened demigods, but fallible human beings. The most basic fact of the Internment was that it did not involve most of the thousands of Japanese Americans in Hawaii, the forward base of operations against Japan for the US military. The commanders of the Pacific Forces knew that the Japanese population was essential to supporting the military operations there, and that there was no clamor in that multi-racial society to imprison their neighbors. The notion that they were a danger to Washington, Oregon and California is ludicrous on its face. The only way to ensure we avoid those errors is to understand the distressing reality of what happened and the people who made it happen.